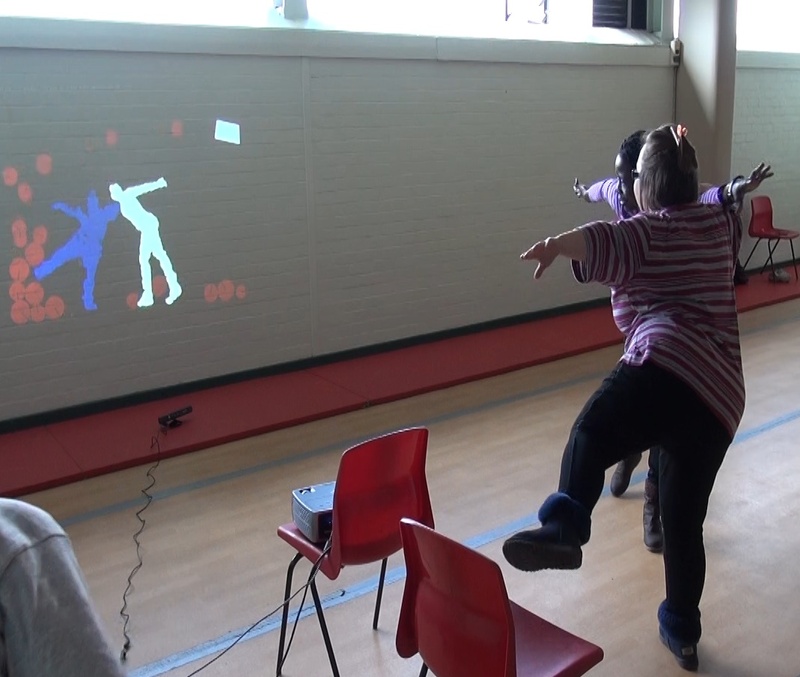 The Michael Sobell Centre, provided the venue for our first Somability sharing session, choreographed beautifully by dance coordinators from the Artis Community True Colours group, Zoe Martin and Linzi Robinson. When I arrived, the computer and Kinect were all set up, and the performers from the Gadlys Learning Curve were in rehearsal. Elegant sequences of expressive dance led to sustained concentration and experimentation with Somability, initially in Flow and Effects mode. For some service users, Balance in Silhouette mode proved compelling as they were able to easily detect their own bodies represented by the simple graphics. Ideas flowed for the next stage of development, both in terms of the design and the choreography. Importantly for this project, there was a strong sense of inclusion, and the commitment to involve more service users within Gadlys and other RCT Centres.